Long time, no blog huh? Man it’s been forever since I’ve even been on here but I’m totally blaming school on this one since way back in February I started writing a post and papers/tests took over and I haven’t looked back since. Now that that whole thing is done I can get back to the fun stuff. This past Saturday I officially became a year older at the ripe old age of 27! Phew! Well little Lenny gave me a special treat on my birthday. She told me to reserve a bit of time in the afternoon for something and put me in the car to just go somewhere. I had no idea where we were going as we drove towards Needham. I don’t really know anything in that town anyway so for all I knew, she could have been kidnapping me and bring me somewhere remote where she was going to hide my body and I’d never know. It was pretty unlikely though since we were with other people so I wasn’t worried. The car stopped in front of Treat and I got excited! 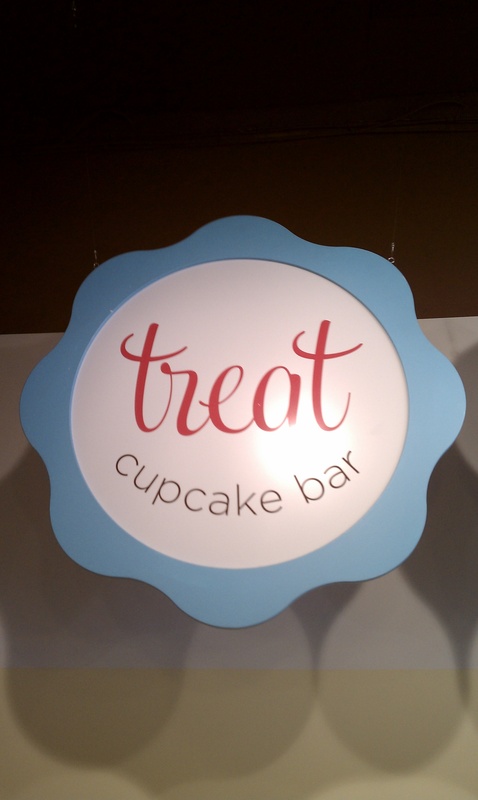 Treat is just about the cutest cupcake shop ever! 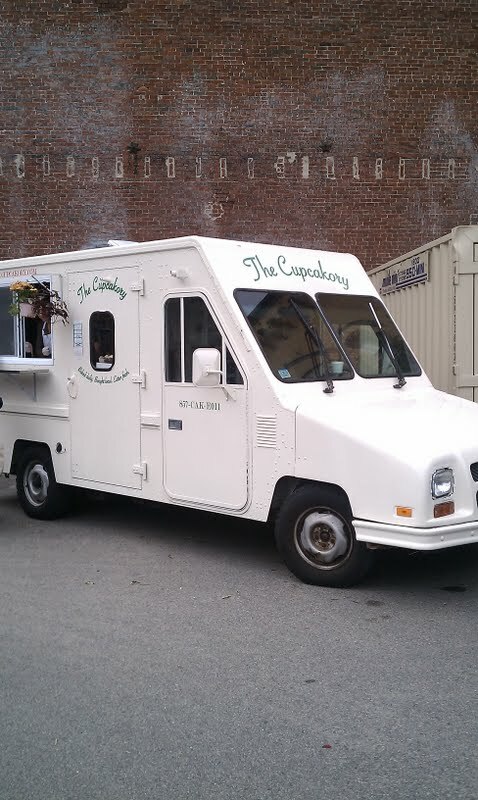 They have one counter that’s filled with all sorts of flavors of cupcakes from Needham cream pie to Oreo, to pink lemonade. 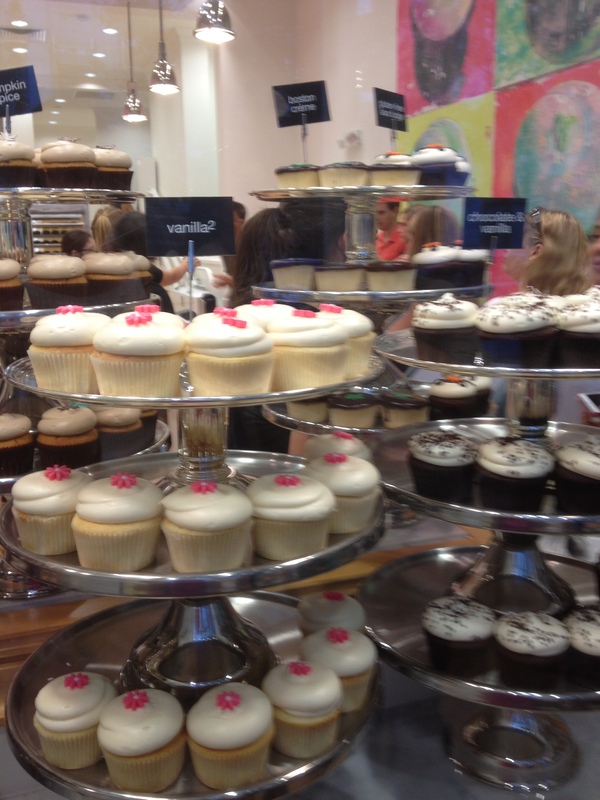 They are super big cupcakes and look really yummy, but aren’t the real reason to go to Treat. The big selling point there is the make your own cupcake bar. How awesome of an idea is that!?!? 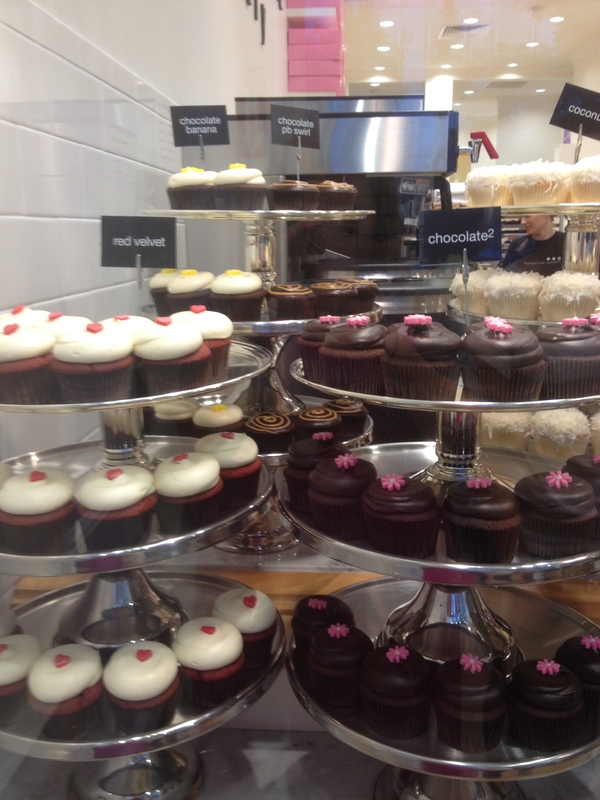 You get to pick from four different cupcake flavors and four different frosting options. Then you get to add in up to three treats for the cupcakes like gummy bears, sprinkles, heath bar, coconut, mini M&M’s…there’s just so many it’s hard to pick! This was seriously like sensory overload for me. I had to let everyone go first because I just couldn’t make up my mind. I ended up with a chocolate cupcake with classic buttercream and Oreos and peanut butter cups mixed into the frosting with chocolate covered pretzels on the side. This part is so fun because they take a blob of frosting and add in the mix-ins to it so you have Oreo/peanut butter cup frosting. It all gets mixed together like when you go to Cold Stone and they put it in a little cup. The cupcake comes in a little tray with your cup of frosting and your cup with any other mix-in treats. You then get to spread the frosting/treats on yourself with these cute little wooden knife and fork they give you. It’s perfect because you can put the whole blob on the cupcake or put it on little by little so that you get some frosting in every bite! The verdict on these cupcakes?? DELICIOUS! The cake was delicious and not dried out at all like you can sometimes find. 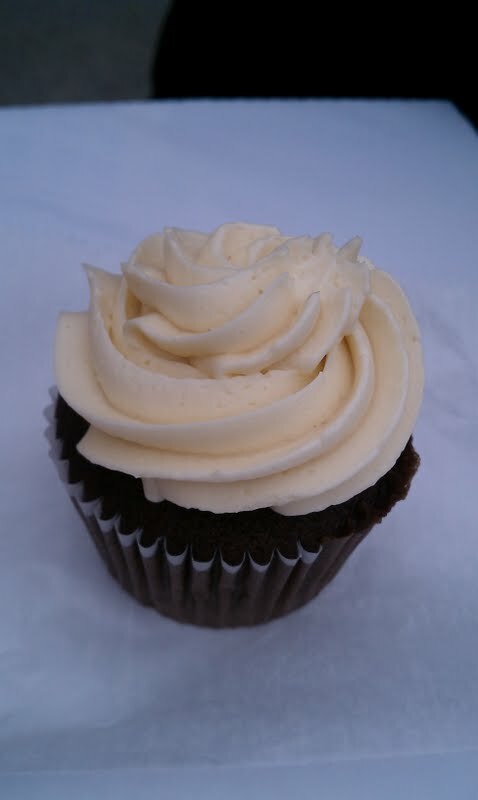 I also loved the buttercream frosting; it was sweet but not that tooth aching kind of sweet where you feel like you’re crunching down on sugar crystals. There are so many options to choose from that there’s got to be something for everyone. 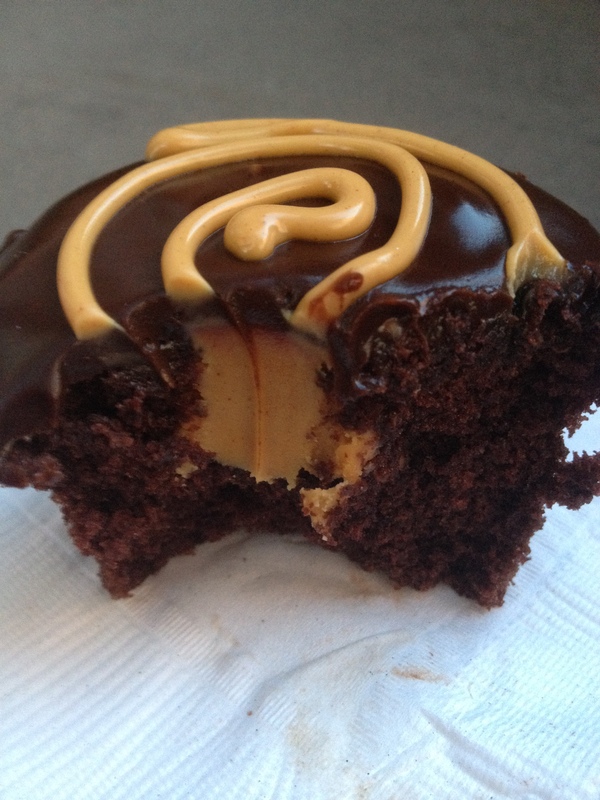 Lenny had a chocolate cupcake with buttercream frosting and coconut, chocolate covered pretzels and chocolate sprinkles. Muff had a funfetti cupcake (love it!) with buttercream frosting, rainbow sprinkles, and peanut butter cups. Joey Cupcake had a yellow cupcake with buttercream frosting, M&M’s, and Oreos. Everyone’s creations looked really good. The make your own cupcakes were $4.25 (with the pre-made flavors at $3.25) but were definitely a good deal since they were about twice the size of a cupcake that you get in most other shops, it was hard to even finish the whole cupcake! 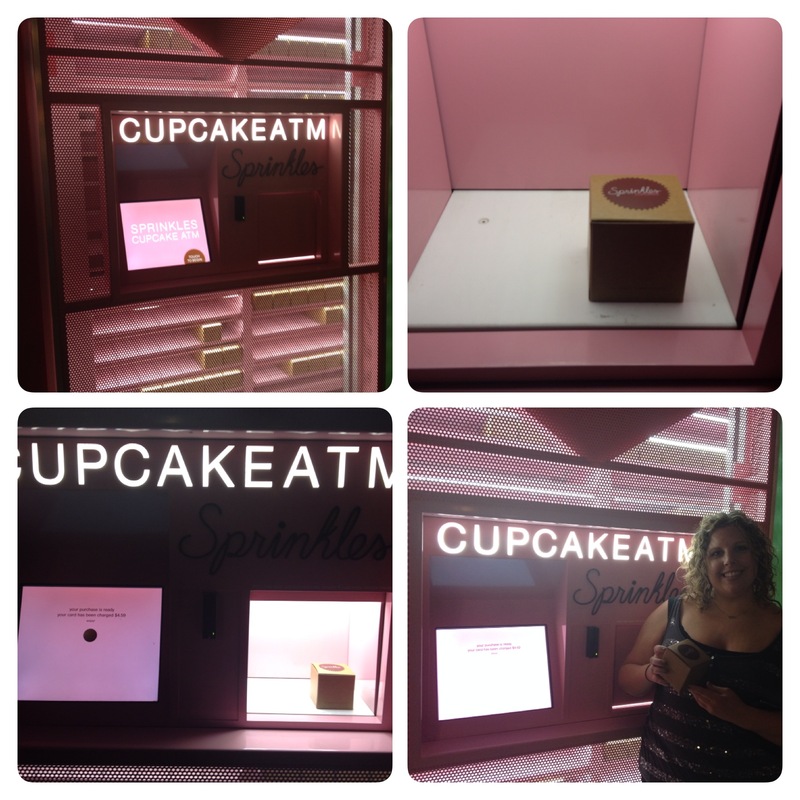 It definitely made for a fun birthday adventure, and I’d definitely go back to try some of their other flavors of cupcakes…they all look amazing. Thanks for the fun birthday adventure guys! This morning I was on my wonderful bus ride to work (okay, it actually is the second worst bus ride ever next to my friend Kristin’s who spends 1.5 hours on public transportation one way to get to our awful workplace) and noticed that the bakery that shall not be named was up for lease. I’ve mentioned how awful this place was before, but today is the big day that I’m actually going to name it (even though most of you already know)…Cherry Bomb Bakery, ugh! Initially when I saw this place was going to open in Brighton Center, I was really excited, only to be completely disappointed once I actually tried it. And you can see on Yelp that tons of people were with me on this one too. 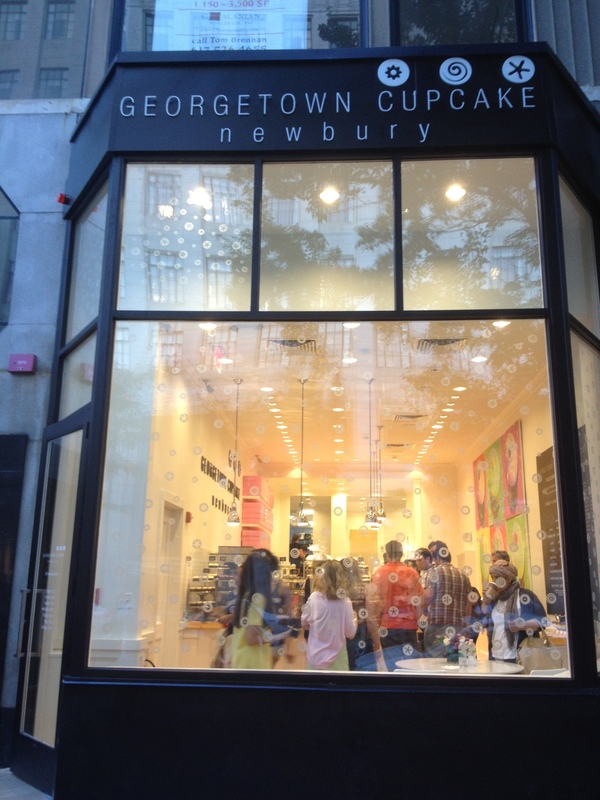 I’m not really sure how this place got any good reviews, but I’m pretty sure it was just from the people who couldn’t get a vegan cupcake anywhere else. I was also disappointed to learn that before opening, the owner of Cherry Bomb was allegedly bashing other businesses in Brighton Center like Athans and CafeNation. I say allegedly since these are internet/Facebook rumors I read but I wouldn’t be surprised considering the hipster snobbery I encountered the two times I visited there. Let me tell you a little about my experience at Cherry Bomb when I went over the summer with Lenny. First off, the service here was completely lacking. You would think in a new business you’d be super friendly and excited to see new customers in the store but this wasn’t the case. We tried making conversation with the girl at the counter telling her we were excited to see them open but she wasn’t too responsive. Since everyone has a bad day, we decided to try again a week or so later but found the service to be no better. Same girl, same bad attitude. It was 7:45 and all she could say to us was that she was closing soon…it seemed like she just wanted us to get out so she could close up shop. 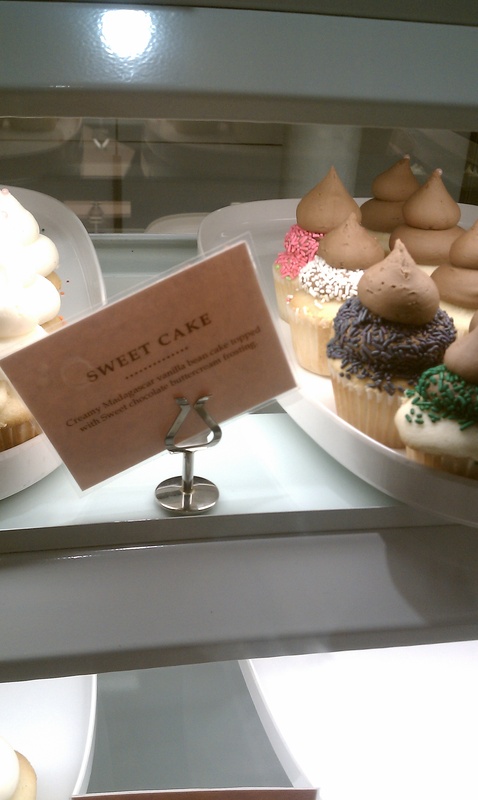 There are a good amount of variety in the cupcake flavors and they have vegan cupcakes. I tried to ask for recommendations but didn’t get far with that. I would have recommended that they put signs in the case with the cupcakes because it’s hard to tell what they are (and we didn’t get a great response when we tried to ask). We ended up picking out the signature cherry bomb cupcake and an orange carmel cupcake. Both of these cupcakes were packaged together in a paper bag so when we got them home they had fallen over and the frosting was mushed together (I have to say that Sweet definitely has a leg up on packaging the cupcakes since you can get them home in one piece). Once we got our mushed cupcakes home we couldn’t wait to dig in. I really thought that while the service was bad, the cupcakes would live up to the hype but was disappointed again. 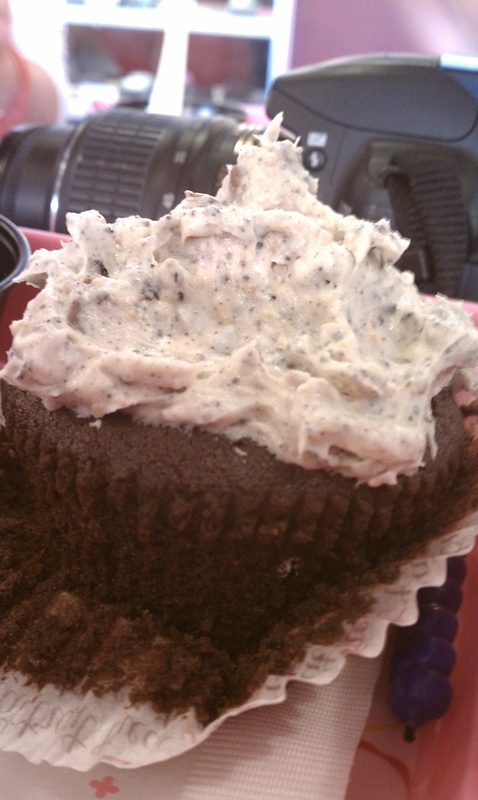 The cake on the cherry bomb cupcake was pretty good but the frosting was horrible. 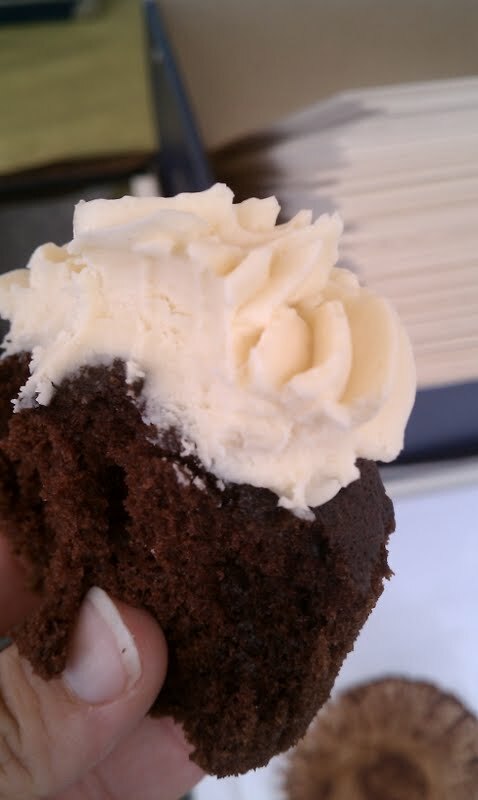 The frosting was so grainy and sugary with a very greasy aftertaste. It was almost inedible Lenny and I split both cupcakes so we could try different ones but had to scrape off frosting because it was just not good. While I did think $2.50 was a decent price for a cupcake, the cupcake just wasn’t even good enough to justify paying for it sadly. 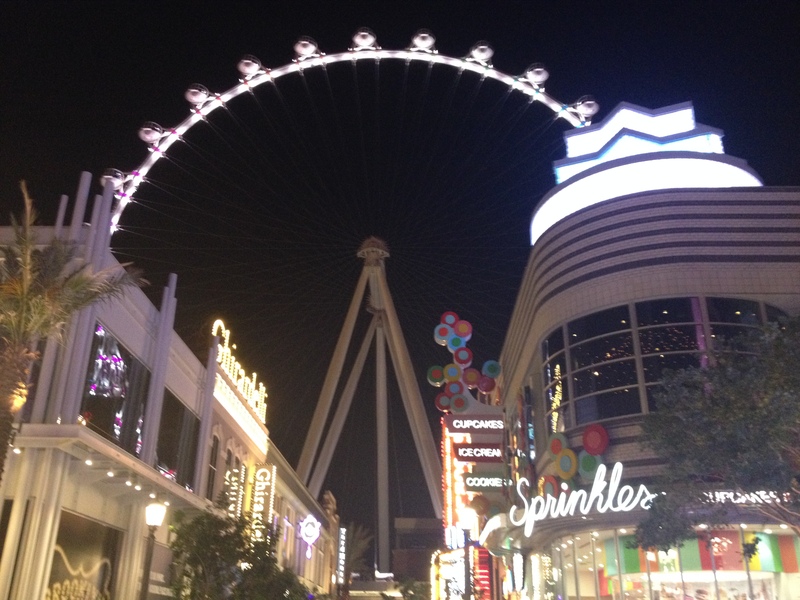 A lot of people bought Groupons for this place (I urged my friends not to!) and apparently they couldn’t fill the orders. I guess they weren’t prepared to keep up with the demand but if you read reviews on Yelp, some people with Groupons didn’t get the dozen cupcakes they paid for. What a ripoff! It’s too bad since they could have been a really great addition to Brighton Center businesses. Apparently they’re closing the store front but the owner will still be doing private catering. It’s just as well, the public masses don’t need to be subjected to those cupcakes anymore. Am I just the worst blogger ever or what?? I know, its been almost a month since I’ve posted and nothing, nada. And sadly I’m back and I’m not even writing about cupcakes. Ok, well I’m not writing about my own cupcakes but this is Adventures in Cupcakes, so I’m writing about someone’s cupcakes. 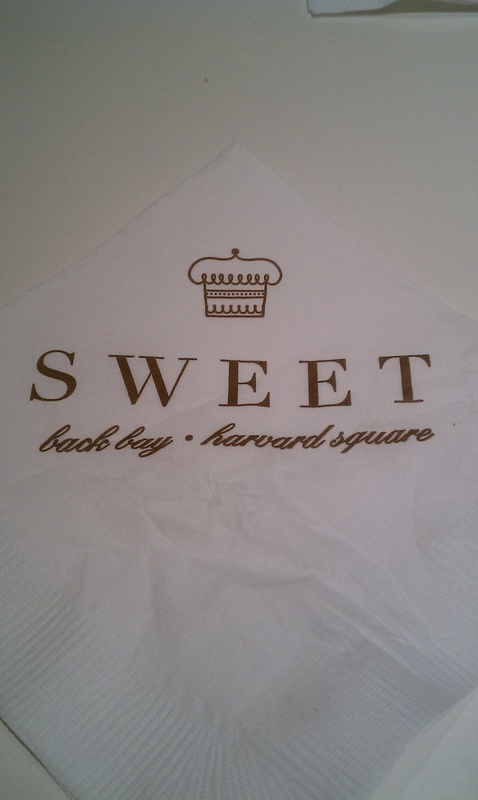 I went to Sweet in Harvard Square last night and only after I had eaten my entire cupcake did I think this adventure would actually be worth blogging about. So sadly, no picture of my cupcake since I scarfed it down but I did try to get a few pictures on my phone before I left so I could chronicle this adventure. Sweet is really cute, its very clean and white looking, kind of modern. Definitely a similar feel with the light colors that I’d want in a cupcake shop, but I’d personally go for a little more homey, old fashioned look. 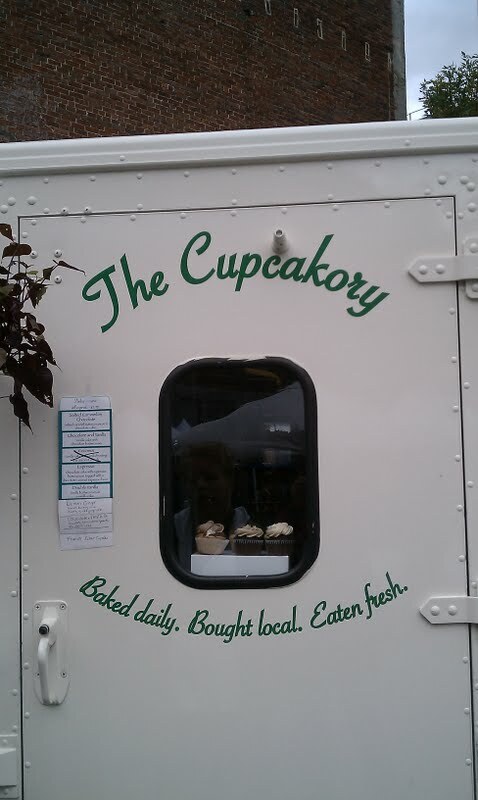 I do love their cute little cupcake logo though that they have all around the shop and on the windows. 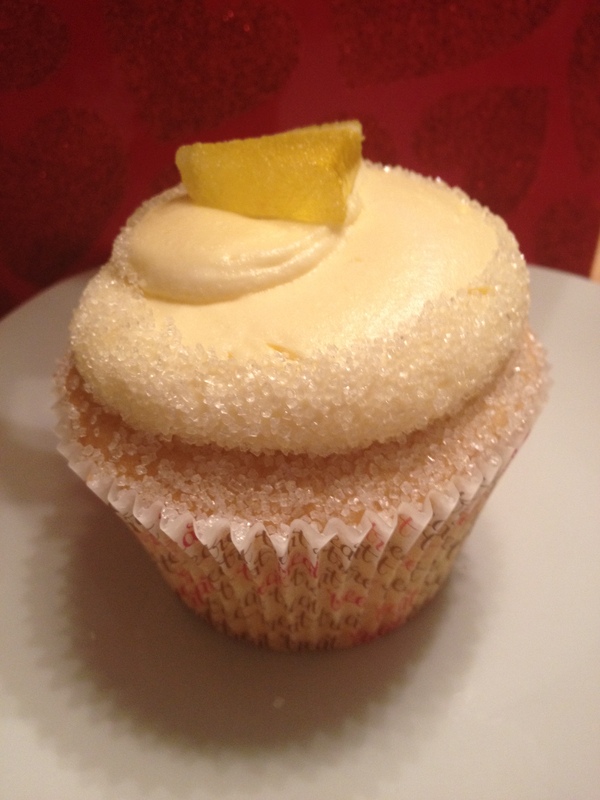 So I’ve had Sweet before and thought they were okay, the frosting is a bit sugary for me, but I’m a huge frosting critic and tend to be really picky about my frostings…I mean who wants a mouthful of grainy sugar and butter mixture? Not me. Sweet does a good job with their frosting unlike our new cupcake shop in Brighton, which will possibly be named at a later time (horrible cupcakes though). 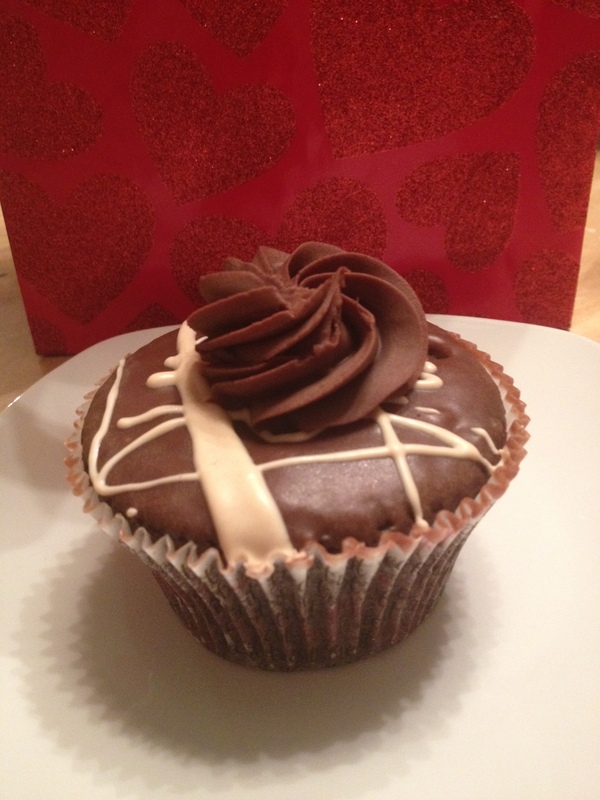 I went to Sweet with my friend Lindy, and she got the sweet cake cupcake which was vanilla bean cake with a chocolate buttercream frosting. For me, I got a strawberry shortcake, which had the same cupcake base as the sweet cake but is filled with strawberry preserved and topped with whipped cream frosting and a sliver of strawberry. The verdict? I definitely liked my Sweet cupcake this time. Surprisingly, the best part was the frosting. 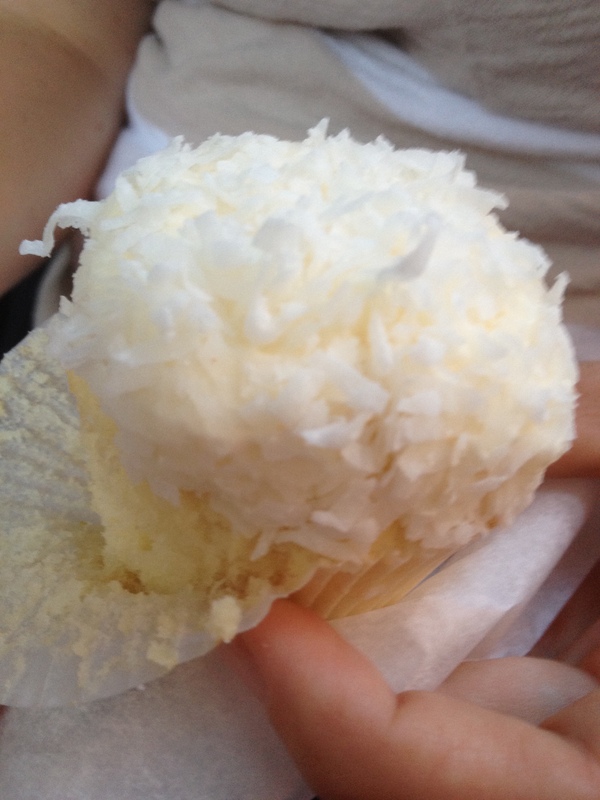 It tasted like the perfect whipped cream but was thick enough to hold up to the cupcake. 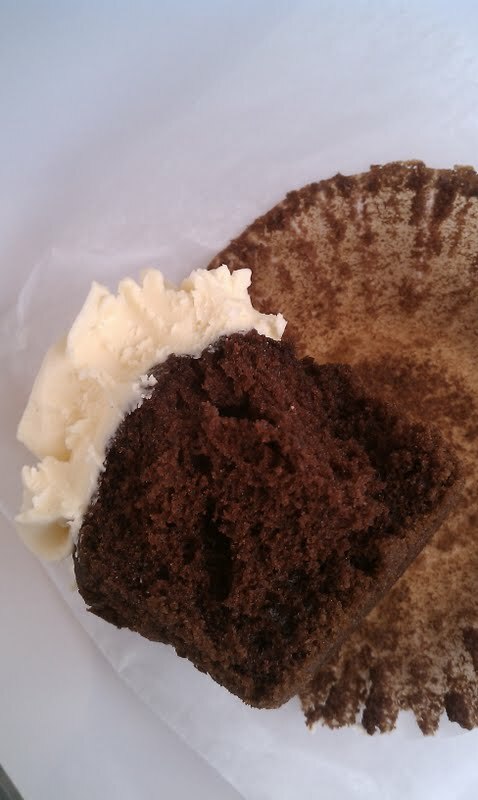 The actually cupcake part was good but a little dense but definitely moist enough. If I was going to make a strawberry shortcake cupcake though (and I definitely will), I wouldn’t put strawberry preserves in the middle. I missed the fresh strawberry taste in this cupcake, so I think I’d go for fresh berries here. 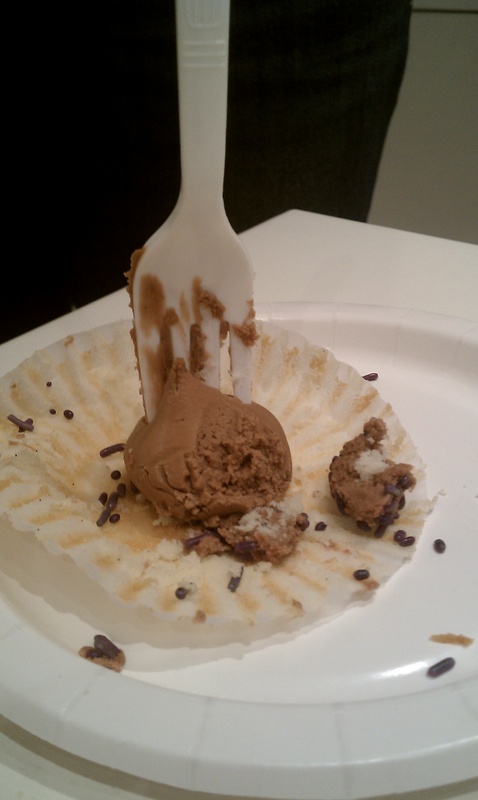 Lindy said she liked her cupcake but it had a bit too much chocolate frosting on it and had to take off the extra dollop from the top. 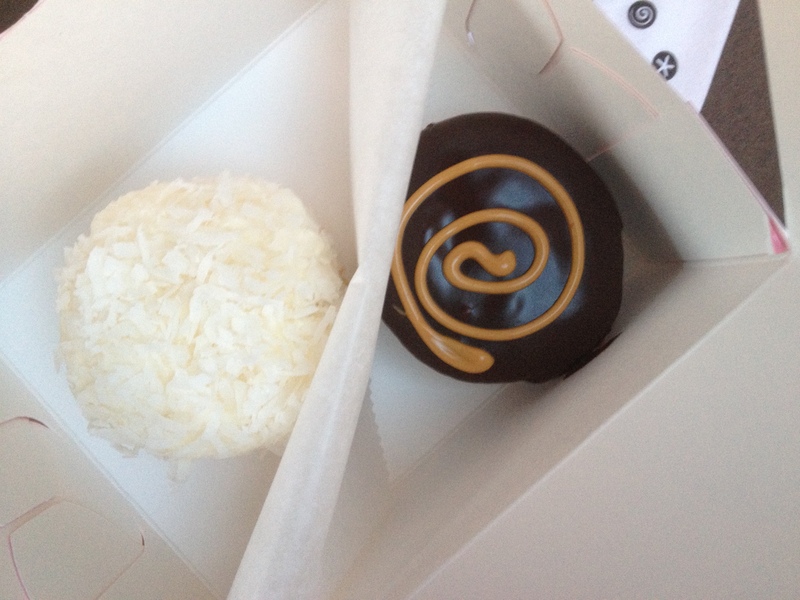 Overall, our adventure to Sweet was pretty successful…its a pretty cute place and the cupcakes were tasty. They have a lot of interesting flavors on their menu with certain ones being featured daily while others are seasonal flavors like the strawberry shortcake or bubblegum (which I’m not sure I’d be adventurous enough to try). 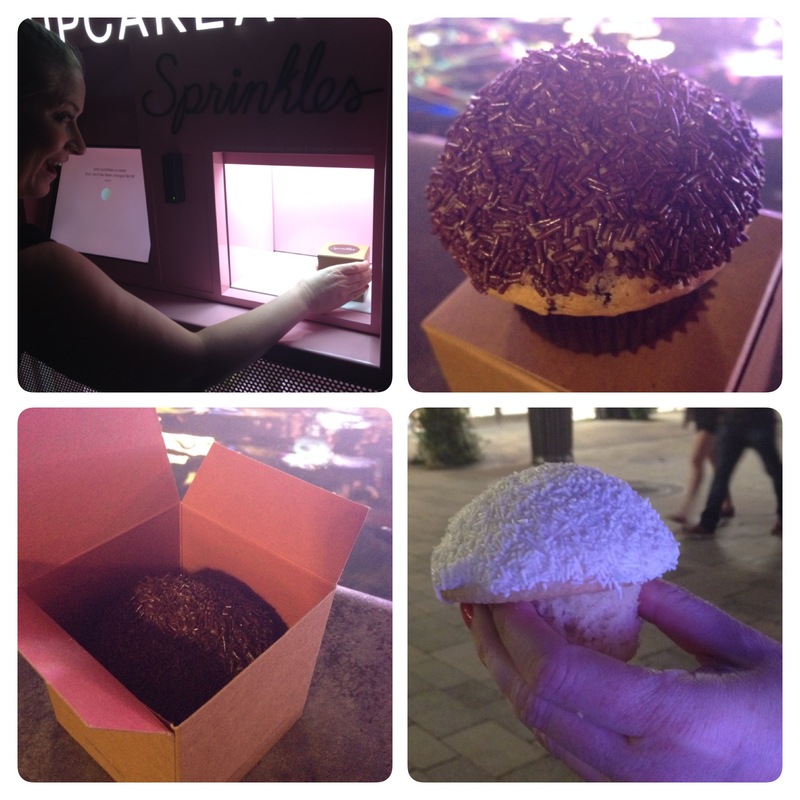 It was definitely worth a try, plus its research for my own cupcake empire!